* Will Question 1 affect property taxes? * How can we cut $12.6 billion in waste? * How do the retirement Govt. and private companies compare? * What are some of the other Mass taxes? * What is Question 1? * Which states do not have an income tax? * How much $ will go back into my budget? * Does Q1 go far enough? * Who’s behind the No vote? * Can we see the state government budget? * Shouldn't we try transparency first? * What is the real budget? Will Question 1 affect property taxes? Groups that oppose Question 1 say that ending the income tax will raise property taxes. Is that true? No. Question 1 forces the legislature to cut state spending, not city or town government spending. If anything, we should cut other taxes as well as ending the income tax -- to get rid of all government waste. The state government hands out $5 billion in subsidies to city and town governments in Massachusetts every year. As of fiscal year 2009, you and 3,400,000 other taxpayers pay $12.6 billion in income taxes to the state government every year. In other words, for every dollar you pay, your town gets back 40 cents. Does that sound like a bargain to you? Let's assume Question 1 wins, we end the income tax, and the very worst "doom and gloom" scenario our opponents like to paint came to pass: the legislature cuts 100% of state aid to city and town governments. You would no longer pay $1.00 to get just 40 cents in return. You'd be 60 cents ahead of where you are now. That 40 cents the state hands out to city and town governments doesn’t go to you. It goes to the politicians in your town – and their special interest pals. That 40 cents pays for things like extravagant and unnecessary building contractors and architects like the ones charging taxpayers $200 million to build a high school in Newton, Massachusetts. They paid $35 million of that to a fancy architectural firm for the school's design – enough to build an entire high school! That 40 cent on your dollar pays for lucrative government employee pensions and generous government employee health care benefits – far better than what you get from your employer. If you're an average taxpayer, how much of that 40 cents benefits your family? For every dollar you pay in income tax, you may get back 25 cents or 10 cents or 5 cents in benefits. That 40 cents of every dollar you pay in income tax that the state hands out to city and town governments is not evenly distributed. Many town governments see only a fraction of that 40 cents. The bulk of it goes to big city governments – home to the state’s worst corruption, crime and dysfunctional public schools. A lot of that 40 cents pays for the worst schools in the state – at a rate that’s often TWICE as expensive as what small and medium size towns pay per pupil for better schools! Who profits most from state aid to city and town governments? The same people who oppose Question 1, who oppose this $3,700 tax cut for you and your family. Government employee unions. Builders who get government contracts. You can vote No on 1, continue to pay an average of $3,700 every year in income taxes and get back perhaps $185 to $985 in benefits. A net loss of $3,515 to $2,715 every year. Or you can vote YES, get back $3,700 on average you're now paying in income taxes, and get back perhaps $0 to $985 in benefits. A net gain of $3,700 to $4,685 every year. Which is better for you, your family, and your neighbors? How can we cut $12.6 billion in waste? Where will we find $12.6 billion in waste to cut from this budget? Our current budget minus the income tax equals the 1999 state budget. · $7 billion in refinancing cost for the Big Dig. · $2.55 billion MORE added this year to the lucrative pensions for retired stategovernment employees - who get 2-3 times the retirement income you'll get if you're an average taxpayer. Government employees retire in their 40's 50's and early 60's - while you have to work until your late 60s. · $1 billion in tax subsidies to multi-billion dollar bio-tech pharmaceutical corporations. · $2 billion in interest payments every year for unnecessary debt spending to fund road projects. Pay for roads with gasoline tax and auto registration fees, and there is no need to rack up debt. Liquidate some of the state's many financial slush funds to pay down debt and reduce interest payments. · $138.7 million tax subsidy to millionaire movie stars and directors. · Several billion dollars/year in excess government employee health care benefits. Bring their copays, deductibles and coverage in line with the average taxpayer. · $60,000 to $70,000 a year paid to toll collectors - plus benefits, plus pensions. This is for UNSKILLED jobs – counting and making change. A job that can be done by public schools 5th graders, high school dropouts, people trying to get off welfare, or even mentally challenged individuals who want to be contributing members of society. · Several hundred million dollars every year spent on unnecessary and overpriced public school construction. Example: $200 million high school in Newton, Massachusetts. A large fraction funded out of the state government budget. · Over $6 billion we could cut from the budget and give back to taxpayers by renegotiating the terms and money of government pensions for state government employees, city and town government employees, and public school teachers. But that’s just the tip of the garbage heap. If the Massachusetts legislature will "Show Us the Tax Money" - open the Massachusetts state government books - as we requested in our 2/8/08 open letter to the state legislature, 3,400,000 taxpayers can be watchdogs to identify and remove the worst excesses and government waste. We propose that the legislature publish the complete $47.3 billion Massachusetts budget – including all off-budget spending items - on a web site that is easily readable and easily searchable. Detail every check written by the state, to whom it is written and what it’s for. Just as they force you to do when you file a tax return. Once we have a detailed budget, we cut government waste by prioritizing. Fund the essential services that people want and need the most. Clean the waste out of each department so taxpayers get the best price possible. Once essential services are funded, cut spending from the rest of the budget. This will leave us with a lean, effective and efficient state government that serves the workers and taxpayers, not special interests. It will cost taxpayers a fraction of today’s Massachusetts government. Because we will uncover much more waste than the $12 billion that the income tax funds, we can then cut the property tax and other taxes - in addition to ending the income tax. How do the retirement Govt. and private companies compare? Why haven't you been told these things about Massachusetts government employee retirement packages? $6 billion back to taxpayers. We can cut $6 billion a year in government spending and taxes by renegotiating these plush, outrageously over-priced government employee retirement packages. Including public school teachers. Is it any wonder that government employee unions are financing 99.8% of the opposition to Question 1, a tax cut for you and your family? Is it right for you to work hard all your life to fund such lucrative government employee retirement pay - and leave you and your family with scraps? Vote YES on 1 - and force polticians to bring budget-busting retirement packages in line with what you'll get. It's the fair thing to do - for you, your family, your neighbors, your co-workers, and 3,400,000 workers and taxpayers of Massachusetts. What are some of the other Mass taxes? Massachusetts government will be swimming in cash from plenty of other taxes still on the books after we End the Income Tax. The Massachusetts' total tax burden will still be higher than New Hampshire's because the city, town and state governments of Massachusetts will still have $57 billion to spend AFTER we end the income tax. Where do they get all that money? * Investment earnings. The state holds tens of billions of dollars in financial assets from which they make billions of dollars in returns every year. If politicians were not overtaxing you all these years and stuffing tax surpluses into these government bank accounts, that wealth would be in YOUR bank account making a return for YOU instead. * Lawsuit settlements, e.g., from cigarette and food manufacturers (a tax on food and cigarette buyers). * Federal grants and subsidies - paid for by your federal taxes. Massachusetts is a “net payer” state, meaning we pay more in federal taxes than the state gets back in subsidies. All these tax and revenue sources is why the city, town and state governments of Massachusetts will still have $57 billion to spend AFTER we end the income tax. More than $16,700 per taxpayer - every year! Ending the income tax is a first, critical step towards making Massachusetts an affordable place for your family to live. Vote YES on 1 ! 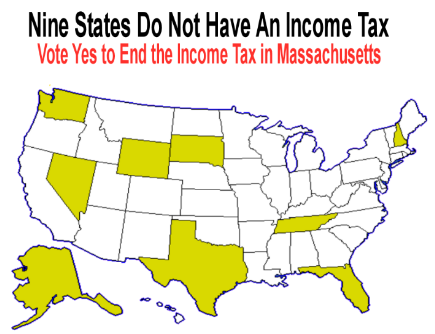 The Small Government Act to End the Income Tax is a Massachusetts citizen initiative - Question 1 on the November 4, 2008 general election ballot. If a simple majority of voters say "YES" to Question 1 on November 4th, the Small Government Act to End the Income Tax will become law. We will end the Massachusetts state income tax. The new law will go into effect immediately when election results are official, and will affect taxpayers starting January 1, 2009. The Small Government Act to End the Income Tax is a binding referendum, not a constitutional amendment nor an advisory question. It's a statute, just like any law passed by the legislature. If a majority of voters say "Yes", it will be encoded in the Massachusetts General Law, the body of law for the state government, the Commonwealth of Massachusetts. - You will save an average of $3,700 for each taxpayer in your family. Money you'll be able to spend on your family, save for your retirement, or give away to your favorite charity - in your own community. - You will no longer pay the 5.3% income tax on wages. - If you're living on an annuity, you will no longer pay the 5.3% income tax on interest or dividends than you need to make ends meet. - If you sell your house or your business, or need to liquidate your stock or retirement fund, you will no longer pay 5.3-12% interest on capital gains. Best of all, we'll take $12.6 billion now wasted and misspent every year by politicians on Beacon Hill and put it back into the hands of the men and women who earned it. This proposed law would reduce the state personal income tax rate to 2.65% for all categories of taxable income for the tax year beginning on or after January 1, 2009, and would eliminate the tax for all tax years beginning on or after January 1, 2010. The personal income tax applies to income received or gain realized by individuals and married couples, by estates of deceased persons, by certain trustees and other fiduciaries, by persons who are partners in and receive income from partnerships, by corporate trusts, and by persons who receive income as shareholders of “S corporations” as defined under federal tax law. The proposed law would not affect the tax due on income or gain realized in a tax year beginning before January 1, 2009. The proposed law states that if any of its parts were declared invalid, the other parts would stay in effect. Your “Yes” vote cuts your state income taxes 50% starting this January 1st – and eliminates the last 50% next January 1st. For you and for 3,400,000 Massachusetts workers and taxpayers. Your “Yes” vote gives back $3,700 each to 3,400,000 Massachusetts workers and taxpayers – including you – on average when we end the state income tax. $3,700. Each worker. Every year. Your ”Yes” vote will create hundreds of thousands of new Massachusetts jobs. Your ”Yes” vote will NOT raise your property taxes NOR any other taxes. Your ”Yes” vote will NOT cut, NOR require cuts, of any essential government services. Your “Yes” vote rolls back state government spending 27% - $47.3 billion to $34.7 billion – more than state government spending in 1999. Which states do not have an income tax? Let's add Massachusetts to the list! Vote Yes on Question 1. How much $ will go back into my budget? * Families will save an average of $3,700 for each taxpayer. Money to pay the mortgage and everyday bills, pay off school loans and credit cards, save for retirement, or give to individuals and charities in need. * No more 5.3% income tax on your wages. * For those living on an annuity, there will no longer be a 5.3% income tax on interest or dividends. * House, business, and stock sales will no longer carry a 5.3-12% interest on capital gains. Sell your stock or your house when you need - not when tax rules may force you to sell at a loss. Best of all, we'll take $12 billion out of the hands of Beacon Hill politicians who waste, misspend, and hand out it out in pork-barrel projects, sweetheart deals, and Big Government Programs. We'll put that $12.6 billion back in the hands of the men and women who earned it who will use it much more wisely than the state legislature. $12.6 billion pumped back into Massachusetts communities will create jobs and save the faltering Massachusetts economy. YES on 1 this November 4th will cut your income taxes in half this January 1st and end the income tax one year later. For you, your family, your friends, your co-workers and your neighbors. Does Q1 go far enough? Does Ending the State Income Tax Go Too Far? "41% waste in Massachusetts state government," says Fabrizio Survey released by Citizens for Limited Taxation in May 2008. The researchers asked likely voters how many cents on every tax dollar they believe is wasted by the Massachusetts state government. The mean average response was: 41 cents wasted out of every tax dollar. 41%. As of fiscal year 2009, the Massachusetts state government spends $47 billion every year -- on top of local government spending. The state income tax takes $12 billion from taxpayers every year. Ending the Massachusetts Income Tax would roll back total state government spending 27% -- to $35 billion a year, the 1999 Massachusetts state government spending level. Reducing state government spending by only 27% leaves the state government way more than it needs. With 41% waste, a 27% cut removes only 2/3rds of the waste in state government spending. There will still be billions more in uncut government waste, every year, in Massachusetts state spending - even after we end the income tax. City and town governments collect an additional $22 billion in property taxes and other revenue. That's in addition to the $5 billion they get in aid to city and town governments. After we end the income tax, and give back $3,700 on average, each to 3,400,000 workers and taxpayers, total Massachusetts city, town and state governments will spend over $16,700 per taxpayer per year. Sound like enough to you? Does Ending the Income Tax go far enough? Who’s behind the No vote? Why are the opponents of this tax cut for you and your family trying to scare and threaten you into voting against Question 1? The opponents of ballot Question 1 are the same groups - government employee unions, large financial corporations and others that profit from high government spending - who have been lobbying and campaigning to RAISE your property taxes for 28 years. They have campaigned for more than 4,000 property tax increases in towns across Massachusetts. They want to raise your property taxes AND force you to keep paying the income tax. There's TENS OF BILLIONS OF DOLLARS IN GOVERNMENT WASTE in the Massachusetts state budget. Opponents of question 1 profit from this government waste. Ending the income tax cleans out part of that waste. A survey showed that Massachusetts voters estimate that 41% of all state government spending is wasted. It may be much higher. 41% is about $20 billion dollars wasted every year. Ending the income tax removes only two thirds ($12.5 billion) of that government waste. There will still be $57.3 billion in Massachusetts government spending AFTER we end the income tax. Massachusetts city, town, and state governments will spend over $16,700 per taxpayer per year AFTER we end the income tax. They spend over $20,000 per taxpayer today - the 5th highest tax burden of any state! City and town governments raise and spend $22 billion every year independent of the state government. That's as much as the 20-year Big Dig project! And that's on top of the $5 billion they get in aid from the state government. Government employee unions are funding 99.8% of opposition to this income tax cut for you. Government employee unions get higher pay, obscene pensions, and lucrative health care benefits compared with the average worker and taxpayer. Corporate lobby groups funded by large financial corporations and others that do business with the state oppose this tax cut for you. Their members profit from high taxes, high government spending, and government regulations that shield them from competition, allowing them to charge you higher prices. An embarrassing .2% of the opposition is funded by individuals. It is almost 100% funded and supported by Special Interest groups. In contrast, proponents of Question 1 to cut your taxes are small, individual donors and volunteers. 99.8% funded by government employee unions. Funded by individuals from their after-tax earnings. Indirectly funded by your tax dollars. Endorsed by unregistered business lobby groups that represent tax-funded and supported businesses. Advocate for targeted tax cuts that benefit only their wealthy clientele. Oppose tax cuts for everyday workers. Can we see the state government budget? Doesn’t the Massachusetts government already publish the state’s budget? Shouldn’t taxpayers be able to look at it and see where the government waste is? The Massachusetts legislature and the governor refuse to show us, and you, the tax money. The “budgets” they publish leave out 40% of state spending. You have to dig very hard to just to get a summary budget that shows the state's total spending of approximately $47.3 billion every year. None of the budgets they publish, even when you dig hard, show the detail that the state government requires of you when you file your taxes. We must see the detail in order to identify and remove all of the waste. Wasteful spending - like double-dipping pensions and body builders on permanent disability leave - are impossible to find in any state budget published for public consumption. You only learn about them when they get leaked to the press - and the press is willing to publicize them. Too often, they won't. On February 8, 2008, we asked the legislature to show us the tax money. To publish the operating budget of each of the state’s 538 agencies and entities on a web site that is easily read and easily searched. To show us all of the state's revenues and expenditures – including approximately $19 billion in “off budget” spending. By posting the full, detailed state budget online, the 3,400,000 workers and taxpayers of Massachusetts can serve as watchdogs for government waste and overspending. Our request of the legislature to show us the tax money remains unanswered. We requested a detailed budget from the state government using a Freedom of Information Act request. We were told they could not produce this until January of 2009 (after the election!) and that they will charge us over $6,000 for this information. Taxpayers should not have to beg for information nor pay for it. Full disclosure of government spending should be automatic. Government transparency should be priority #1 for the legislature and the governor. These tax consumers should be required to show you the tax money. To detail state spending just as they require of you, the taxpayer. Until they do, it is reasonable to suspect they are wasting much more than 41% of what they spend - the amount voters already believe they are wasting. Do you want your tax dollars paying for a government department that refuses to fully disclose its budget online for you and other taxpayer to see? Shouldn't we try transparency first? Shouldn’t we try to force the state government to open its books first, then pass a tax cut? Transparency has already been tried. The Freedom Of Information Act (FOIA) is already on the books. FOIA was passed to force transparency of government finance and other government information. It requires the government to release information upon written request from any citizen and to charge no more than a nominal fee for the service. But FOIA doesn’t work. The federal and state governments have stonewalled and blocked thousands of FOIA requests. Our last of several requests for a detailed Massachusetts state budget using the FOIA was met with a reply from the state indicating that they would only provide us the information if we pay over $6,000! They said the soonest they would provide us this information is this January 2009 - after the election! The days of waiting for the legislature to open its books and do the right thing have long passed. The situation is now urgent. High spending by the Massachusetts legislature is bankrupting the taxpayers and driving workers and businesses out of the state. We must reverse this immediately by ending the income tax. What is the real budget? $47.3 Billion is the total state government budget for this year (fiscal year 2009). Opponents of this tax cut for you - politicians and special interests who profit from high government spending - talk about only part of the budget. They're hiding from you $16-19 billion dollars in "off budget" government spending. FACT: $69.3 billion is the total of state, city and town government budgets in Massachusetts this year. FACT: Politicians in Massachusetts are spending more than $20,300 per taxpayer per year. Yikes! No wonder workers and taxpayers have been leaving Massachusetts for states with no income tax. FACT: Massachusetts has the 5th highest tax burden in the country. After we end the income tax, our state's overall tax burden will still be higher than New Hampshire's. While some mainstream news reports accurately cite the $47.3 billion in state government spending, a number of news articles give cover to the opponents of this tax cut for you by reporting partial figures as the "state budget." This media distortion helps to cover up the real spending - and helps hide and obscure the government waste in Massachusetts government. The media's refusal to report total state spending is a breach of taxpayer trust, and it cripples the democratic process designed to represent the majority of Massachusetts voters. The $47.3 billion total state budget comes from an audited Massachusetts government report at this government web site: TOTAL MASSACHUSETTS BUDGET. Go to page 320 of the pdf file (page 312 of the government report) titled "Ten-Year Schedule Of Expenditures And Other Financing Uses By Secretariat." You'll see that Massachusetts state spending two years ago was $44.9 billion. If you look at the nine prior years, you'll see state spending goes up at the rate of over $1.2 billion per year, putting it at $47.3 billion this year. As sponsors of Question 1 to End the Income Tax, we’ve been in several debates with our opponents. They do not deny the validity of this government report that shows $47.3 in state spending - because it is irrefutable. It’s the state’s official, audited report on state government spending published by the state Comptroller's office. In their attempt to distract you from knowing that the state is spending $47.3 billion every year, they point out that part of that budget is lottery prize money. We agree that the $3.5 billion the state pays in lottery prize winnings is an unwise expenditure to cut. Legislators need to look to the remaining $43.8 billion portion of the state budget and find the most wasteful and unnecessary $12.6 billion part of it to cut when we end the income tax. The city and town governments spend an additional $22 billion from your property taxes and other revenues every year ($27 billion total spending, minus $5 billion in subsidies from the state government). Go to this link to see their budgets: Total Massachusetts City and Town Government Income and Spending! Total Massachusetts state, city and town government spending this year: $69.3 billion. Ending the income tax cuts state spending by $12.6 billion – leaving $56.7 for politicians to spend every year. It puts $12.6 billion back into the hands of the Massachusetts workers and taxpayers who earned that money. That’s $16,700 per taxpayer per year for Massachusetts government – AFTER we end the income tax. Sound like enough for you and your family to pay for Massachusetts government? Vote YES on 1 November 4th to END the Income Tax. Want to let your friends, co-workers and loved ones in on the state's financial cover up? Print our flier "Why Haven’t You Been Told These Things about Ballot Question 1?"